S/Sgt. (Retired) Dale Arthur McLeod, 66 – East Stewiacke, passed away peacefully Wednesday, October 31, 2018 at home with his loving family by his side. Born in Sussex, N.B., he was a son of the late George and Pearl (Smith) McLeod. Dale was passionate about the outdoors and as a young man he enjoyed scouting and received his Queen Scout Award. He later led Scout Troops in the many places in which he lived and worked. 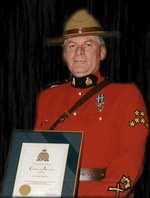 Dale enjoyed his 36-year career with the RCMP and much of his work was spent with the First Nations Communities. His career began in Ottawa and later in Manitoba, NWT and then finally in 1979 he came to Nova Scotia where he had numerous postings around the province until he took a position in Nunavut in 2004 to finish off his career. Above all, Dale was a family man. He and his wife, Janet were best friends and in later years they enjoyed traveling which took them to many destinations including; Hawaii, Arizona, Florida, Myrtle Beach and the Caribbean. He enjoyed being a father and grandfather and spending time with his children and grandchildren brought him joy. He shared his love of the great outdoors with them and often enjoyed taking them out on the four-wheeler and in the canoe. Dale touched many lives both professionally and personally. Most of all, he was there for his family. He was our rock and will be deeply missed by all. He is survived by his loving wife, Janet (Lanctin); son, Shane (Lori) McLeod; daughters, Tania (Jesse) Godard, Stephanie (Travis) Powers; grandchildren, Cameron McLeod, Cole McLeod, Joseph McLeod, Aiden Godard, Elizabeth Godard and Declan Powers; brothers, Wayne (Minnie) McLeod, Richard (Shirley) McLeod; sisters, Donna (Edwin) Murray, Katherine (Andy Dawson) Heustis. Along with his parents, he was predeceased by sister, Marilyn (Allen) Parlee.